Heat emanating from the bed of embers is unbearable even from afar. Flames darting up occasionally light up the large crowd gathered to witness the event. Attendants stir up the fire with long poles to keep the embers alive. Frenzied devotees dance incessantly to the beating of nathasawaram revving up to participate in the all important event. The traditional fire-walking ceremony at the Ruhunu Kataragama Maha Devale is about to begin. Kataragama is a sanctuary of all faiths. God of Kataragama is popularly regarded by the Buddhists as the deified embodiment of a righteous king called Mahasena, who ruled the regional kingdom of Kacharagama (Kataragama) in the pre-Christian era. 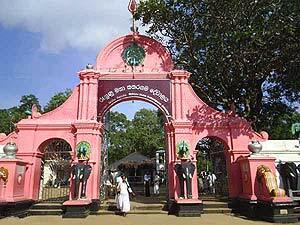 The main temple within the precincts is said to have been built originally by King Dutugemunu in the second century BC fulfilling a promise made to the God of Kataragama before engaging in battle with King Elara. Closer to the temple is the Bodhi tree grown from a sapling of the Śrī Maha Bodhi in Anuradhapura planted in the third century BC. 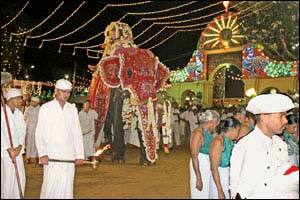 The ceremonial tusker leaving the Kataragama Dewalaya carrying the casket representing Lord Kataragama Skanda. Several meters to the north is the sacred dagoba, the Kiri Vehera, built on a spot hallowed by the Buddha during one of His visits to the island. Hindus worship the Kataragama God as the son of Siva identifying him by several names such as Velayuthan, Murugan, Vadi Vel, Karttikeya, Shanmugam, Netrasutta et al. Muslims too have their own shrine as they consider the place sacred to them. 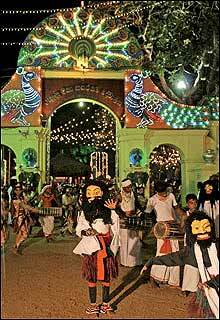 Among the many ceremonies held annually in different parts of the island to honour the deities of the Buddhist and Hindu divinity, the Esala festival held in honour of the God of Kataragama is the most popular and well attended. It is held for fifteen days when the annual perahera is conducted in all its pageantry with large crowds gathering during the festival time. 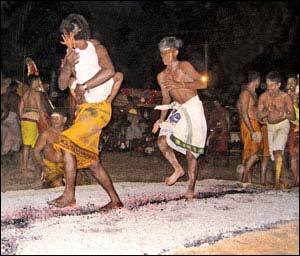 The most breathtaking event is the fire walking ceremony conducted as the terminal act of the festival. A large heap of tamarind logs is lit up in the evening on the day before the fire walking and kept burning till the wee hours of dawn allowing it to burn completely into a heap of glowing embers. The embers are then levelled into a flat bed with long poles held at the two ends by two attendants working on either side. No unburnt wood is allowed to remain and it is interesting to see how the watchful eyes of the attendants spot even the smallest piece of partly burnt wood that is immediately removed as otherwise it could be hard and painful on the treading feet. Four lamp stands of gokkola (tender coconut fronds) are erected at the four corners of the bed. The devotees who intend to tread the fire get ready for the arduous task. They cleanse themselves in the Menik Ganga as a precursory act and change into clean clothes preferably red, the colour of the God of Kataragama. Some carry objects like tridents, spears, coconuts and oil lamps and keep themselves warmed up dancing to the tunes of nadaswaram. There is a short respite only when the music stops probably for the nadaswaram players to rest their aching fingers. The devotees are back on their feet when the music resumes. A frenzied devotee holding a coconut in both hands accompanied by a drummer beating a sonorous note and a group of followers comes to the centre of the arena dancing frantically. He runs to the four corners and supplicates before the four lamp stands. He departs after several minutes doing reverence at the four corners. Gyrating supplicants oblivious of the surroundings work themselves up both physically and mentally for the task ahead of them. 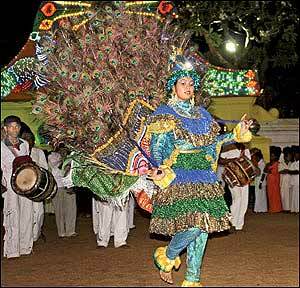 Closer to the main shrine is a group of female dancers performing a traditional dance paying obeisance to the God of Kataragama. Placed on a side is a pingo with fruits, curd and treacle in the two pans probably as an offering to the god. The flat bed of embers glowing in the darkness of early dawn that has been put into its final shape is about eight metres long, two metres wide and about twelve centimeters high. The chief custodian (Kapu Mahattaya) of the Maha Devale (main shrine) garbed in spotless white with a white turban and accompanied by a few attendants walks up to the bed of embers with a tray of holy ash and a goblet of holy water, to begin the ceremony at the auspicious hour. Facing the Maha Devale he utters some incantations and sprinkles a little ash on the fire followed by a sprinkling of holy water. Fulfilling his task he returns to the devale signaling the commencement of the holy event. Meanwhile the devotees who are to take part in the fire walking ceremony have all gone to the Menik Ganga for the final cleansing, return dripping wet. The large crowd that had been waiting patiently for several hours pushes forward so as not to miss any part of the ritual about to begin. Leading the group of devotees is another Kapu Mahattaya, garbed in red and carrying a kavadi on his shoulders. Walking up to the edge of the bed of embers he pays reverence to the God. Saluting the bed of embers he steps on to the fire and walks gracefully along the full length and proceeds direct to the Maha Devale. Not the slightest grimace is visible on his face. Nothing further happens till he enters the sacred precincts about three hundred metres away. It is now the turn of the others to display their devotion. They all walk in single file along the bed of glowing embers. Some walk slowly, some try to cross it in a few leaps, some walk at brisk pace while some dance their way through. One person is seen carrying a small child in his arms. The pingo of offerings that was lying by the side is carried by one person. Two little children of about twelve years of age walk the fire without any hesitation or the slightest discomfort. That is the strength of their faith in the Kataragama God. Sitting close to the bed of embers let alone walking on it, is itself a trying experience. Hundreds of devotees, young and old, male and female, walk the fire without a single casualty. It is an amazing spectacle.The morning star shines brightly in the cloudless sky. Eastern sky takes a pale blue hue in the early dawn. The embers had been doused at the conclusion of the ceremony and are reduced to a heap of ashes. Devotees walking past take a final look at the ashes determined to return again the next year.